This project came about because I wanted scale tram wheels, but for an S4 tram track. The only ones I could find of the right diameter were from the Proto:87 Stores, but they are of course for 16.5mm gauge. 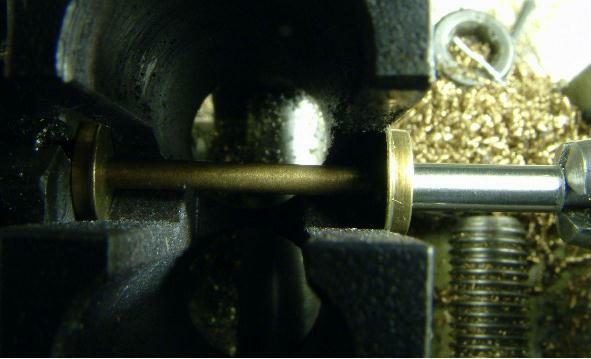 As they are insulated one side, but interference fitted on the other, re-gauging them accurately and without damage required some toolmaking. This is the tool I made, and how it is used. First, chuck up a bit of 1/8" bar stock. Face the end off if you're that way inclined. 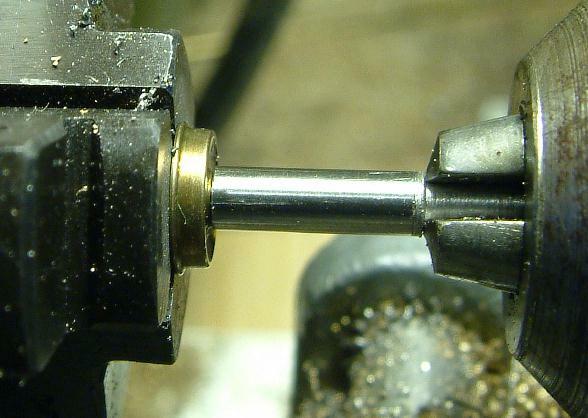 Fit a 1/8" (or 3mm) centre bit to the tailstock chuck. 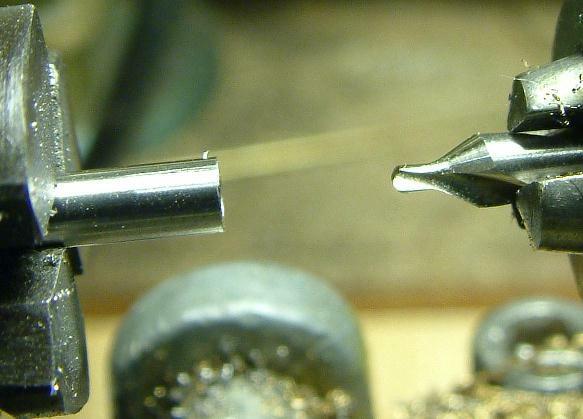 Wind the centre in until the taper has cut the face of the stock out to a little over 2mm. 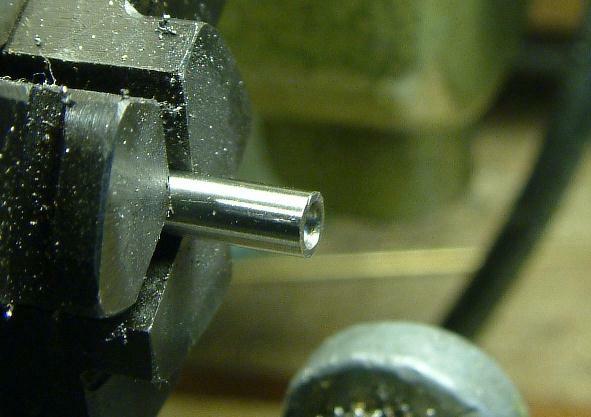 Fit a 2.05 or 2.1mm drill bit to the tailstock chuck, and cut in about 0.2mm. The amount needed will vary according to the thickness of the wheel you are going to press and gauge, and the back to back gauge used. If in doubt, omit this stage. 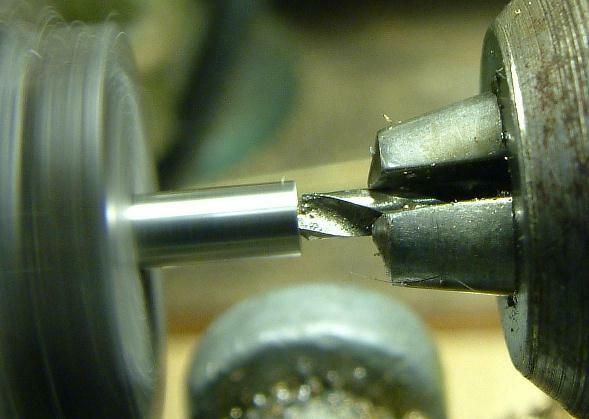 Now part off to the length you want, turn the job round in the chuck, and cut a step in the shaft. This will prevent it slipping in use. 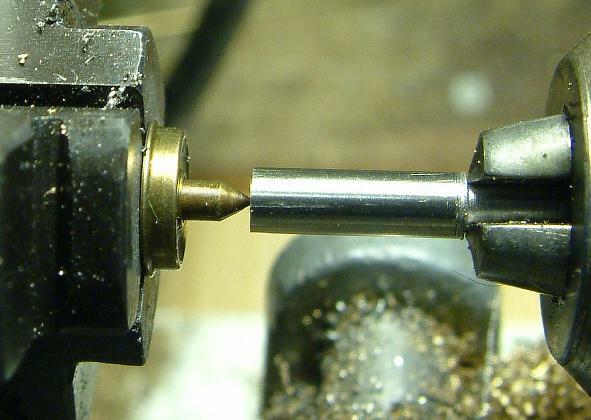 Having removed one wheel from the axle (the easy one is usually the bushed one), place the axle loosely in the chuck, and line up your new tool with the axle. 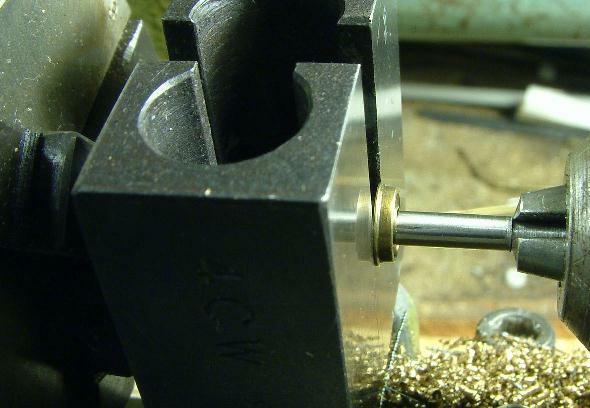 Wind the tailstock screw until you feel the resistance of the wheel's interference fit. It will look much like this. If all has gone to plan, the wheel will be the correct distance from the end for both the desired gauge. 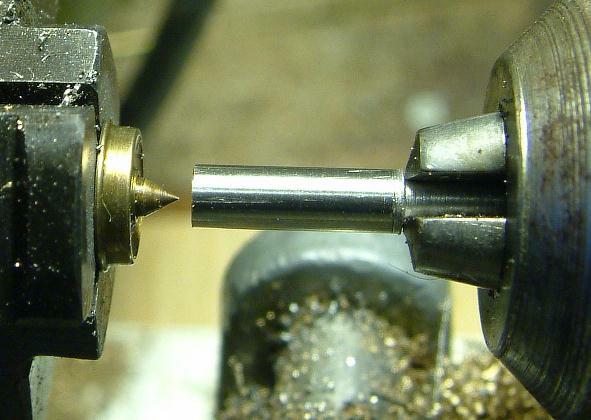 Take the axle out of the chuck, and place the other wheel on the other end of the axle. 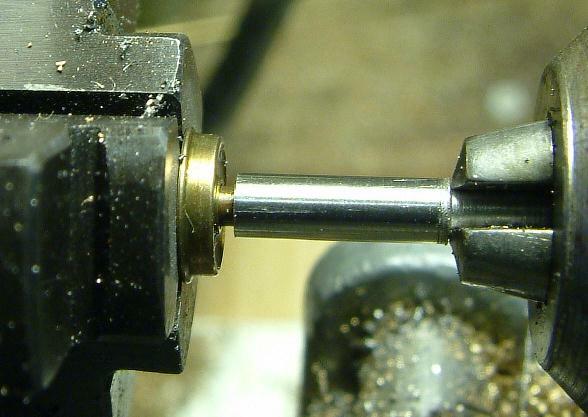 Place the wheelset in your back to back gauge (a now unobtainable Exactoscale is version shown), and this assembly in front of the chuck with the jaws open enough to clear the axle, but not so they clear the wheel. Push the wheels together with the new tool. If the axle is not quite centred within the gauge, turn the whole lot round and push again, but not quite so far this time! These wheels are Andy Reichert's Proto87 sets, in this case 7mm diameter, 1.7mm tyre width. 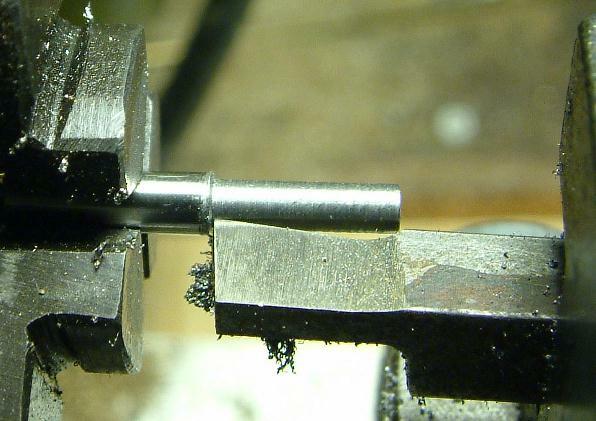 To make production gauging and axle setting even easier, make a second tool and fit one to each chuck. 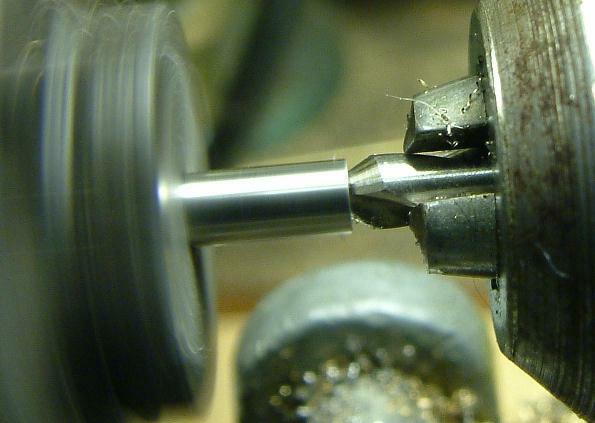 For removing the first wheel where they are both really tight on the axle, make a short version, and drill the back to fit a GW wheel puller.